And no pricing on their website? I saw on another site 70-76k. I’m guessing that’s base price. To me all of the gimmicky or cosmetic changes are not importamat. What is important is the construction and new hull design. Lighter, Faster, Stronger will only be established after some hard on the water testing and results. Anyone know anything about the vacuum sealed livewell? Is this new, what’s the benefit if any? So much for them costing less than a Ranger, mine was $86k loaded to the gills. This one is $89,145 as shown.... It have a 250 or 300? Top red section says 250, specifications below say 300? Keith Daffron is a smooth talker on all the Vexus videos, but in the end it looks like smoke and mirrors to me. It have a 250 or 300? It says 250 on the top of the card. Supposed to get rid of the sloshing on rough rides. I thought I heard him say that all of the fiberglass was vacuum constructed which would result in a lighter boat. I thought BassCat already did that. If the bass boat model can take the abuses of big water lakes like Erie and St Clair then I'll take a serious look at them. At the price point they are apparently selling at, any owner that has problems will be vocal and it will spread like wildfire because haters will be looking for any reason to put them down. That is under the specs for HP options. 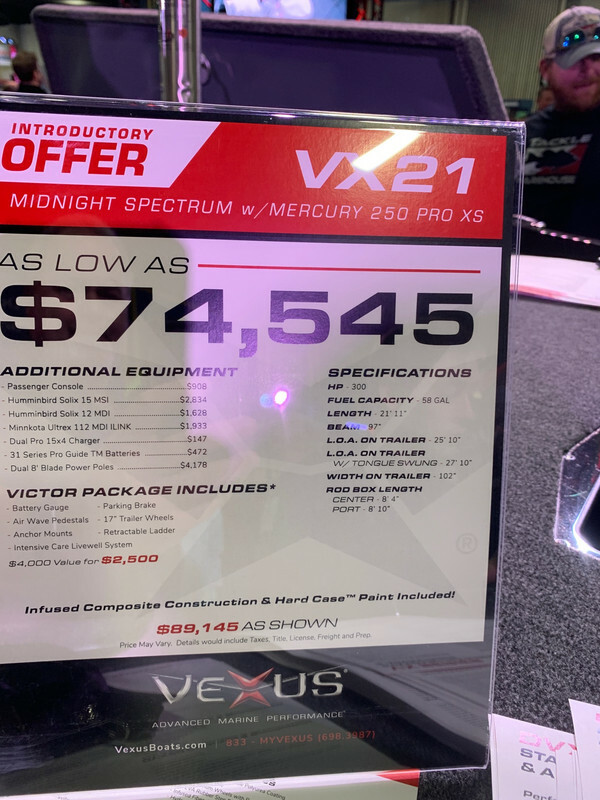 The top says, "Introductory Offer VX21 Midnight Spectrum w/Mercury Pro XS." Intuition tells me that a 300 would add to the cost. I left the Classic Expo around 1:PM. They still hadn't taken the covers off. Hopefully they'll have them off tomorrow. I don't think so. My take on this is they went over every little detail, and made incremental improvements to a lot of things. The hull is vacuum infused glass, which is state of the art hull manufacture. Fancy speed boats are built this way, and painted over. They've been doing it for years now. The livewell gets improvement. The cantilevered consoles are gimmicky to me. Air ride , sliding seats seem cool. I do like the cooler setup, and is it me, or does the seating area look way lower than the deck? I know they tout the raised deck, but those don't look all that different from most new boats. Maybe I'm used to my skinny hulled Bullet. The lighting all over the place seems to be fad these days. Even kayakers are running gaudy LED setups, lol. The notched bow is weird looking. I don't mind the lack of glitter. Always hated glitter, but that's what you always got with a bass boat. I do wish they had more color options. So, I don't think it's any one thing, but the sum of improvements. They sure as heck trademarked a ton catch phrases, lol. I left the Classic Expo around 1:PM. They still hadn't taken the covers off. Hopefully they'll have them off ﻿tomorrow. That's right about when they did the reveal. Look it up on Facebook. The main and only important thing to me would be hull design (ride/durability). Things like a storage box in the trailer step (seems to me they would get robbed at a ramp), Retractable emergency ladder (hoping it doesn't deploy in rough water or break the latch) and shock absorber seats (again, they have to be durable) as well as all of the other "goodies" that have already been incorporated (adjustable seats, net storage, non carpeted flooring) in current boats. I could care less about a wrapped steering wheel. Figures, that's about par for the course for me! But, but,but.....It's got a intensive care livewell sytem. Bass ambulance! makes me love my old girl even more.........she's paid for............20 years ago !!!!!!!!!!! I have to stay that I really like the Vexus aluminum boats. That said, I don't like the Vexus fiberglass boats even a little bit. I did like the seat suspension system. I did get Forrest Woods autograph. The seat shock absorption is nothing new. Just new for bass boats.